I have been collecting Wisdens for a while now and in 2005 set up this Website to pass on my Wisden experiences, this site was the first ever created on the internet to explain about Wisdens to the masses and it is regularly updated with valuable statistics to help every Wisden collector when needed, to enhance their set. This site includes a popular discussion forum (wisdenclub.com) which has kept me entertained since '05. Over time we were offered Wisdens from members and also people asked if we had any spares to fill gaps in their sets. 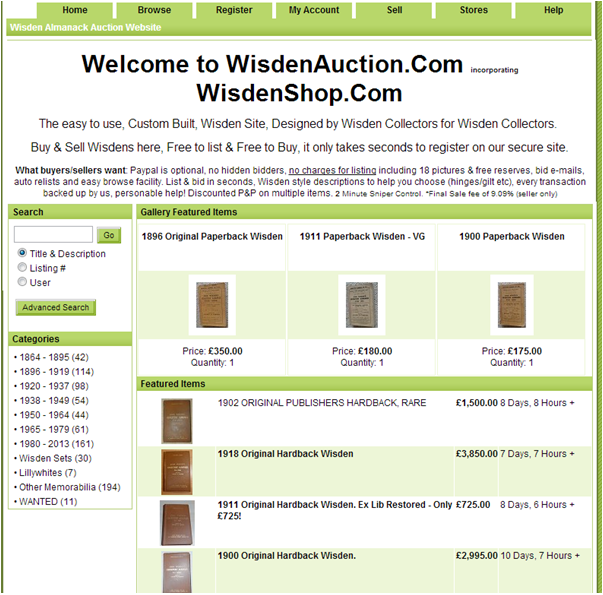 This led to our online Wisden Catalogue and this evolved into our sister site wisdenauction.com (see 2013 Wisden, pages 50/51), we improved the look and feel of this site in August 2013, Happy Collecting, Chris Ridler, Wisden Collector. 1871 Wisden - 8th Edition - Paperback - Spine touch ups. The above prices are the amount the buyer paid at auction, not hammer price, please note for you to have won this book you would have had to outbid the winner. One of the hard first fifteen to find, especially in Original form and with Original Covers. I am currently reading my set and pop notes into the www.wisdenauction.com newsletter, here is a snippet of the write up from 1871 : Gentleman vs Players (July 18/19) Players were missing Daft, Willsher & Wootton plus others (names becoming ever so familiar) so the Gentlemen a shoe in? Just, by 4 runs. The gents slumped from 176-5 to 187 a.o Graces usual hundred (109), Carpenter took 135 minutes to get his 36 in the players 121. The gentlemen made just 87 leaving the players 154 to win, they need 10 off the last wicket, it was silent when #11 marched out, but they made just 5. North vs South (June 6/7) was famous for George Parr playing in his 26th season. Still hitting to leg superbly well, the south were all bowled in their second innings and it was also noted that Mr Buller had a runner (he was run out first innings as he twisted his ankle! Not very sporting was that!) ‚¬€œ fielding position ‚¬Å“Long field‚¬ was mentioned, any idea where this is? (Long on/off/leg ‚¬€œ 3rd man?) the north won by 6 wickets. 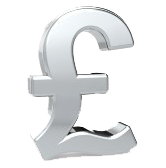 : Please contact us for the full write up. My 1871 Wisden, as pictured, is a paperback with spine touch ups, the spreadsheet says it cost £2650 but not sure of the date, probably 2012. 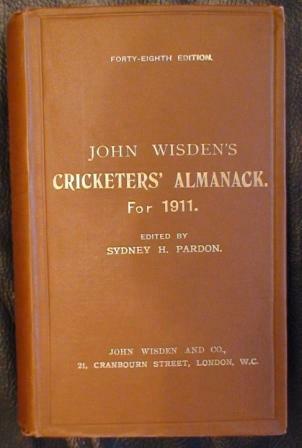 In 1864 John Wisden wrote a cricket book, many cricket fans collect these Wisdens and this "Wisden Search App"
Free Wisden Advice from the team that helped Wisden with the new Guide. 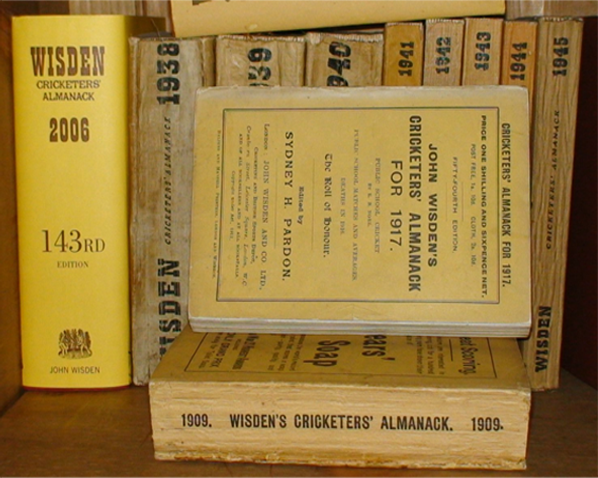 Need a valuation for your Wisden set for Insurance purposes or to sell, we have valued 100s of sets and happy to value yours.